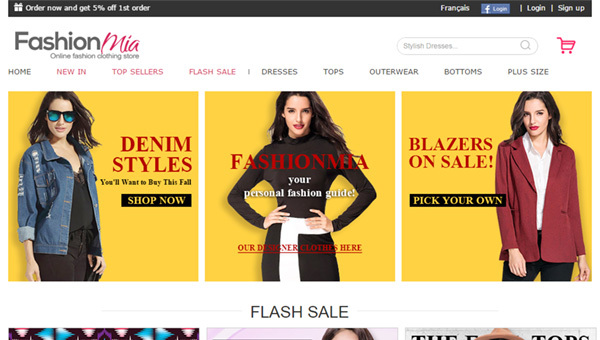 FashionMia - is an online shop from China that offers you a wide variety of clothing for women. It has a lot of dresses, shirts, and underclothes as well as bags, shoes and different kinds of accessories at very low prices. The shop doesn't have limits for the quantity and the cost of order. You can order one cheap item or a huge amount of them in one package. Most of the products have high quality. The vast selection of sizes allows finding the needed clothing for everyone. But sometimes some confusions may occur when you select clothes and shoes. You should be quite attentive. We recommend checking all sizes according to the sizes at "Size Chart" page. This page is located at the bottom of FashionMia site. The shop offers a great variety of delivery services, but, unfortunately, all the services are paid. The total shipping cost depends on the destination country, selected delivery service, how many items you order, and the total weight and volume (size) of the parcel. From time to time FashionMia makes different sales where you can find a lot of items with a good discount. The shop has its support service, and it is possible to communicate in English. I've had nothing but good experience with Fashionmia and their customer service. Prices are great as well. Nothing really to complain about.